The Rain God blessed Nyokum – at its 50th year of central celebration at picturesque Yazali this year even as Arunachal Pradesh Chief Minister Pema Khandu along with Deputy Chief Minister Chowna Mein not only donned but lived the life of a proud Nyishi for the day. “Nyokum Ane is happy with her children and is showering her blessings from the heavens,” said Khandu, dressed as a Nyishi warrior, to the huge crowd of festival revellers on Monday. 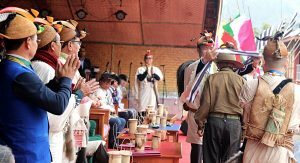 Lauding the Nyishis for preserving their rich cultural heritage and taking pride of their roots, Khandu said Arunachal Pradesh is lucky to have them as one of the most populous communities and leading from the front for the rest to follow. He appealed to the community to set an example in preservation of the state’s rich and varied cultural heritage so that the world comes to Arunachal to witness and savour its unique identity. 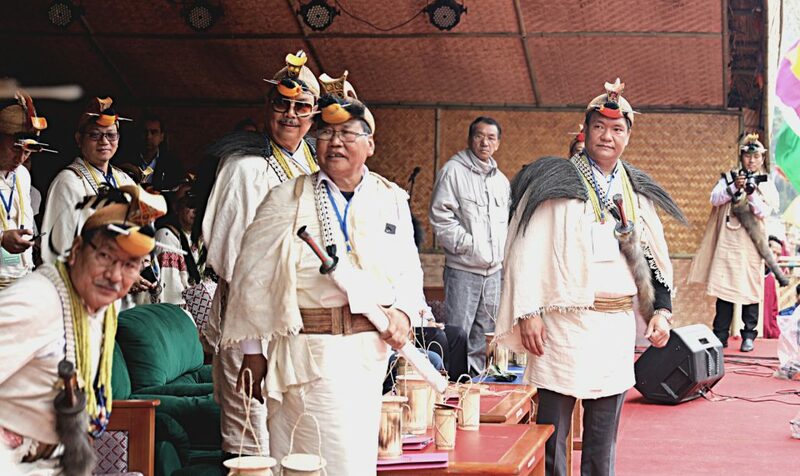 Khandu observed that the indigenous festivals like Nyokum can be promoted for cultural tourism and the State Government is actively considering the option. He said sufficient fund provisions will be kept in the next Budget for celebration of local festivals by all tribes of the state. “It is indeed praiseworthy that the organizers of this festival have not sought any financial help from other sources but have voluntarily contributed to it,” he pointed. Nyokum, this year, was organized by the villagers of Talo under the Chairmanship of Toko Jyoti, who is a chief engineer with the state government’s PHE&WS department. Khandu while dwelling upon few programmes initiated for welfare of the people and development of the State said that connectivity is the only panacea to all hurdles of the State on its way to self-sufficiency. Deputy Chief Minister Chowna Mein also had words of praise for the Nyishis. He viewed the effects of globalization cannot be stopped but can be compromised without compromising with the State’s distinct cultural identity. “Nyishis have kept alive their great legacy. We, the other tribes of the State, need to learn from you!” he said. Mein, who also holds the Finance portfolio, informed the people of the pain being taken for preparing the ensuing Budget of the State. Both Khandu and Mein earlier paid their respects to the Nyokum deity at the altar to the chants of the priests. According to festival organizing secretary Biki Bath, this year the Nyokum at Yazali has gone pure ‘organic’. He informed that the main stage, pandals, huts and all houses in the festival ground have been constructed from locally available bamboo by the villagers themselves. “We haven’t hired any material from outside for construction of the main stage as is a practice. Except for the lights and sound everything is organic…even the cup for drinking and plate for eating are made of bamboo,” Bath added.